After seeing Really Strategies make a user conference tagcloud (more precisely, a wordcloud, as it’s built from words, not tags) in response to my post where I showed the Seedcamp wordclouds, some of the guys inside Mark Logic decided to make a wordcloud for this blog. 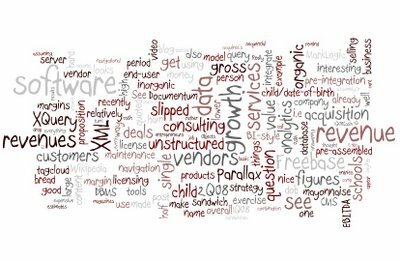 After seeing the cloud they built for my blog, I decided to try Wordle myself and, boy is it fun! To which one of my salesfolks responded, “software, revenue, growth” — what a shock. I’m Dave Kellogg, technology executive, investor, independent director, adviser, and blogger. I’m also a hiker, oenophile, and fly fisher. From 2012 to 2018, I was CEO of cloud enterprise performance management vendor Host Analytics, where we quintupled ARR while halving customer acquisition costs in a highly competitive market, ultimately selling the company in a private equity transaction. Previously, I was SVP/GM of Service Cloud at Salesforce and CEO at NoSQL database provider MarkLogic. Before that, I was CMO at Business Objects for nearly a decade as we grew from $30M to over $1B. I started my career in technical and product marketing positions at Ingres and Versant. I love disruption, startups, and Silicon Valley and have had the pleasure of working in varied capacities with companies including ClearedIn, FloQast, GainSight, Lecida, MongoDB, Recorded Future, Tableau and TopOPPs. I currently sit on the boards of Alation (data catalogs) and Nuxeo (content management) and previously sat on the boards of agtech leader Granular (acquired by DuPont for $300M) and big data leader Aster Data (acquired by Teradata for $325M). I periodically speak to strategy and entrepreneurship classes at the Haas School of Business (UC Berkeley) and Hautes Études Commerciales de Paris (HEC). Kellblog covers topics related to starting, managing, leading, and scaling enterprise software startups. My favorite topics include strategy, marketing, sales, SaaS metrics, and management. I also provide commentary on Silicon Valley, venture capital, and the business of software. Kellblog by Dave Kellogg is licensed under a Creative Commons Attribution-NonCommercial 4.0 International License.